Juan Mata celebrates with the travelling supporters as his winner strikes a dagger into Norwich's Premier League survival hopes. We're having a Premier League party with Leicester in a couple of hours' time. "I fear for the Canaries, my old team. I can see the body-language of the players now at Carrow Road and it isn't good. "They now have to win their two remaining games, but I doubt their character." "This game had 0-0 written all over it but Bassong, not for first time, put his mark on the game with horrendous mistake and that cost Norwich the game. "Three or four Norwich players dropped to their knees and that tells me they knew they had to win to survive." The Norwich players trudge off the pitch, beaten and clinging on to their Premier League status. Games away to Watford and home to Everton on the last day of the season will define their season. Manchester United have remaining games to play against West Ham and Bournemouth. 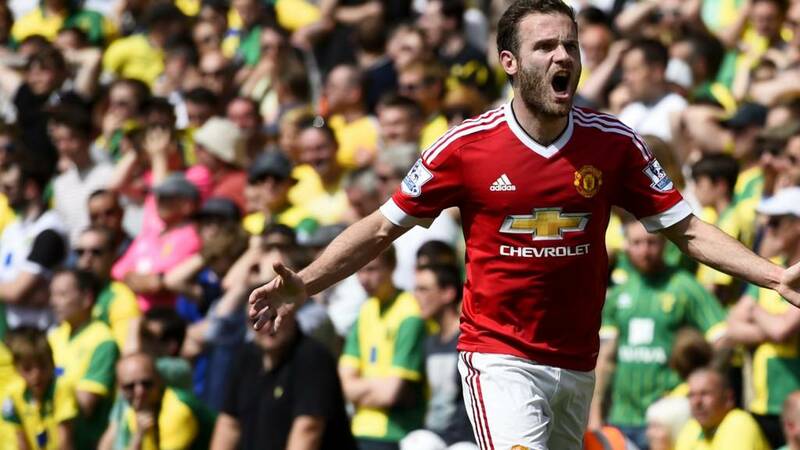 Juan Mata with the winner as Manchester United keep their Champions League dream alive. Defeat leaves Norwich staring into the abyss. If Chris Smalling came up against Stone Cold Steve Austin in a WWE ring, I'd put my money on the England defender. Tough and uncompromising, the centre-back has had a solid game. "Memphis Depay has got great technique, he got it up and over the wall but just about six inches wide of the post." Memphis Depay's free-kick has too much curl on it and goes narrowly wide of John Rudd's right-hand post. Tim Tyler: For most of this game, it was hard to tell which team Man Utd or Norwich City FC were the team facing relegation. "This United performance is the kind we've seen too often this season. Slow, ponderous and not having much of a creative force. It's as though they don't want to make mistakes, they're too drilled. They have been laboured." Gary O'Neil with a excellent tackle on Juan Mata, winning the ball and taking the man but Craig Pawson pulls out a yellow card. He's got that one wrong and more seconds ebb away. "United haven't done enough to win the game but Norwich have handed them it. "Norwich have had good shape but the oomph to go and win the game hasn't been there." Brilliant, brilliant defending from Chris Smalling. Ivo Pinto whips a tantalising cross from the right flank, which Dieumerci Mbokani is winding up to head into the back of the net, but the Englishman flies across to head the ball away to safety. Defender Timothy Fosu-Mensah gets instructions from Louis van Gaal and comes on the pitch for Michael Carrick. Adnan Januzaj receives some pelters from his team-mates. He was told to strip and get ready by his manager twice, before being told to sit back down. Harsh. Could have sealed the game there! Superb play from skipper Wayne Rooney, who holds the ball up on the left before playing a beautiful ball into the path of Morgan Schneiderlin. The Frenchman, through on goal, screws his shot wide and that's a chance wasted by the visitors. Middlesbrough secure a draw at home against Brighton to confirm promotion back to the Premier League. Will Norwich still be there to play them? Seven minutes left at Carrow Road. Memphis Depay strides past Ivo Pinto - that was Cristiano Ronaldo-esque. The next bit was more like Bebe, or Gabriel Obertan, as his cross goes across the pitch and out for a throw-in. Cover your eyes, Manchester United fans. That was shocking. Last throw of the dice from Alex Neil. Graham Dorrans comes on for Norwich in place of Jonny Howson. Dorrans' first act is to head wide from a free-kick.